The first stop (bus or subway) after Windows of the World themepark, Baishizhou has come to refer to a 7.5 sq km sprawl of handshake buildings that was originally part of the “Shahe Overseas Farm (沙河华侨农场)”. This highly congested and irregularly built area is also the first stop for many new migrants to Shenzhen because of its central location, convenience, and lowest of the low priced housing. Simple answer: historically OCT and Shahe were part of the Shahe Overseas Farm, which was established in 1959. A farm was a collective agrarian work unit in which the agricultural workers received a salary and had housing, but not landuse rights. Displaced villagers from the 1959 typhoon were relocated here as were Overseas Chinese displaced by political turmoil in other parts of Southeast Asia. In 1985 this history becomes complex, even by Shenzhen standards because although Shahe farmers were culturally and socially peasants, legally they did not have the full status of peasant and were therefore did not have full landuse rights. In 1985, the 12.5 sq km Shahe farm was divided into the Overseas City conglomorate (华侨城集团 – 5 sq kms) and Shahe (7.5 sq kms, an area that continued to be a “farm” that was neither city, nor village, but rather a strange unit of five villages – Baishizhou, Xin Tang, Tangtou, Upper and Lower Baishi). Shahe residents could not collectively build industrial areas (as in other Shenzhen villages) because as members of a farm, they did not have landuse rights. However, as agricultural workers, they did have housing rights. The historic rest is more a function of the laws of inequality that structured the difference between rural and urban life under Mao. The people who developed OCT were urban, educated, and well connected within the national government. They used their resources to design and grow one of the most impressive and wealthiest of the Shenzhen experiments. It was not, however, a work unit that was designed to incorporate Shahe residents except as labor and food producers. In contrast, Shahe people had neither centralized leadership, nor any land on which to create a non-agricultural livelihood. Moreover, as cultural and social peasants, most had neither the education nor resources to do more than build lowrise buildings that continue to be the basis of their income. Last year (2009), Shahe finally incorporated. However, given that all they have is the landuse rights for their individual housing, it remains to be seen what will be made of this tangled mess. I suspect that the next flush of income will come from “rural urbanization” in which landuse rights will transfer from residents to the city in exchange for a negotiated settlement, which will include architectural and environmental upgrades. Ironically, it has been the Shahe/OCT model of rural urbanization that has been most actively pursued outside of Shenzhen under the rubric of “learn from Shenzhen”. This is the model in which farmers are deprived of all landuse rights except housing and the actual resources for development are in the hands of urban educated officials and entrepreneurs. In contrast, the more pure (for definite lack of a better word) Shenzhen model is one in which peasants also had landuse rights for livelihood and grow into hereditary stockholding corporations with factories, real estate holdings, and collective cultural holdings (ancestral halls, stages, and recently museums). To visit Shahe go to a Baishizhou bus or subway stop. If you head north, you’ll meander into Xintang, Tangtou, and Upper and Lower Baishi. Baishizhou is located south, once upon a time on Shenzhen Bay. Shahe is variously segregated from OCT by walls, barbed wire, and greenspace. This entry was posted in noted, photos, shenzhen fieldnotes and tagged baishizhou, blogsherpa, greenspace, nanshan, oct, rural urbanization, shennan road, shenzhen identity, urban village. Bookmark the permalink. This is the neighborhood I’ve lived in and around for four years now (and will be leaving in a month). I’ve always wanted to know the history, thanks for sharing. What fascinates me about this neighborhood are three things a) the “city side” on the west-side of Shahe Road with Wanpan and other gardens, and the east-side “farms” of handshake houses, b) the constant negotiation of public space, with chengguang chasing out shaokao vendors one night and patronizing them the next. There’s been a truce for a few months where they vendors just push down towards Tangtou until midnight or so – but what makes that road different than the main arteries of Shahe Road? and b) the complete lack of any public parks inside the neighborhood what is likely to be one of the densest places on the planet. hey trey, thank you for questions. usually what makes roads different is jurisdiction. there are roads that the city polices, the districts police, and then neighborhood watches, which are actual sub-police stations. 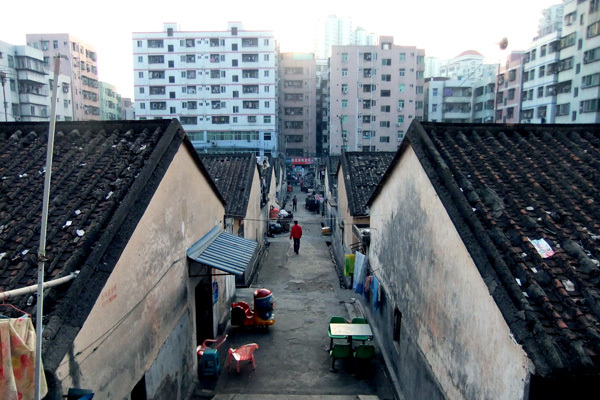 one of the ongoing sites of negotiation in shenzhen urban villages and the non-village of baishizhou is where city oversight stops and neighborhood oversight begins. as a general rule (proven in the inevitable exceptions) the police do not go into the larger and more organized village-neighborhoods, but do oversee the urbane/upscale residential districts/ neighborhoods. there are no public parks because baishizhou has been developed on its pre-reform plats. village housing is built on pre-reform housing – so that planning a park would mean taking land from someone, raising the issue of compensation.